When two pieces of wool cloth are rubbed together, nothing really happens – maybe some heat from the friction develops or those annoying little pills pop up. But, when you’re done rubbing (and feeling kind of weird that you’re rubbing cloth together) you’re still left with two pieces of wool. Separate, individual pieces. On the other hand, when you place that wool in hot water and apply friction, the fibers begin to activate and deactivate. Fibers are loosened, pulled, and built back together. When aggravated under moisture and heat, the fibers are easily bonded together. 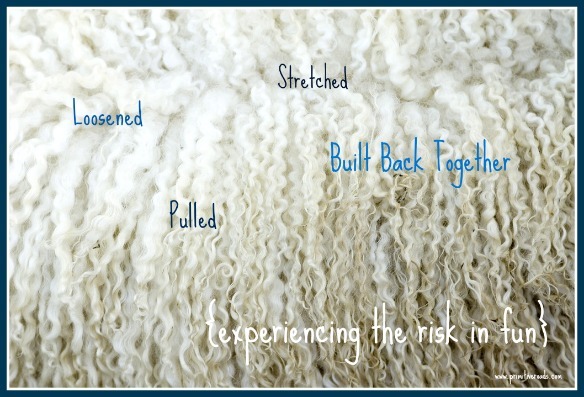 The new wool cloth is felted – stable and strong. Marriage is like making felt. Sometimes friction isn’t enough to bind two people together. It’s possible to do life together as two separate entities, two people coexisting, relying on their own strength and individual value. But, the heart of marriage is unity. Put two people in hot water, where they are stretched and loosened, and the core of who they are will start building together. Spaces will develop in their inner fiber creating room for other fibers. Bonds are formed and a strong, united relationship can develop. I think having fun with your spouse should involve risk – an element of hot water. Laughter is healing, “just because” is always a good reason, and playtime still applies to adults, but those things can be maximized when put under a little heat. When we get out of our comfort zone, especially in the way we have fun with our spouse, we create more space in our hearts for the relationship to grow. I’m not suggesting you involve yourself in a high-speed chase on your way to a romantic dinner or give yourself unnecessary stress in the effort to add a heating element to your relationship. What I am suggesting is a willingness to do something new, even in the way you have fun together. Take a risk. Do something out of the ordinary. Laughter is sometimes sweeter when it’s the result of something new. Tim wasn’t very familiar with Bed & Breakfasts, so we built in a stay at one on our honeymoon. B&B styles vary and this was the type where all the guests eat a one big table – which can be semi-awkward for newlywed introverts. Conversation topics ranged from hiking to bar mitzvahs and everything in between. Had we not strayed from the Hilton path, we wouldn’t have had covert smirks over our bruleed grapefruit and “did he really say that?” moments to remember. Getting out of your comfort zone in the fun department isn’t always a success, but the imperfect experiences couples share are part of the heat that builds strong bonds in marriage. Try a new sport and laugh at your abismal tennis swing (that’s from personal experience). Try an ethnic cuisine and surpress giggles as your hubby chokes down a foreign food for the first time. Try homemade instead of store bought then smile together while you go to the store to buy what you just failed to make. Laughter isn’t always about laughing, it’s about the experiences that precipitate the laughter. When those experiences are out of the ordinary – risky – you not only get laughter, but you also stretch and pull your relationship out of yourself and into one another. Strong, sturdy bonds are formed when you let your guard down and take risks – all in the name of fun.